Istanbul is not a city that you see; itâ€™s not even a city that you â€œdoâ€� as you cross items off your itinerary and snap a few pictures. Istanbul is to be savored, like a chilled glass of raki, slowly appreciated and enjoyed with all your senses. Istanbul, Turkey, has been known for generations as â€œThe City of the Worldâ€™s Desire.â€� It is a beguiling fairytale setting, a romantic, spice-filled world, a once-ravaged kingdom that has risen from the ashes to become a hub of twenty-first century fashion, finance, and culture. Once Constantinople, capital of the Byzantine and Ottoman Empires, this intriguing Turkish city has always been an important crossroads for travel and has always been distinctly cosmopolitan. At the confluence of Europe and Asia, Istanbul is in the unique and enviable position of being both a deeply traditional culture and an edgy contemporary city. Today, side-by-side with ancient mosques and palaces stand trendy restaurants, galleries, and boutiques. Visitors can see the history and the promise of an exciting future all at the same time. Among Istanbulâ€™s many other distinctions, it is the only metropolis in the world that is located on two continents: Asia and Europe. 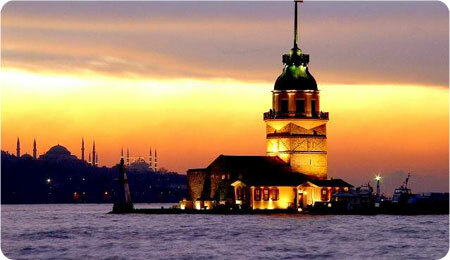 It lies on the banks of the Bosphorus Strait, which separates the cityâ€™s European section and its Asia section. 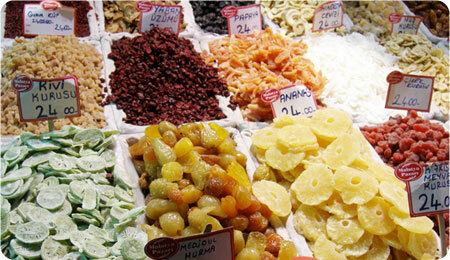 It also connects the Black Sea with the Sea of Marmara. Its strategic position straddling two continents is conducive to trading and the city acts as a portal into both Europe and Asia. 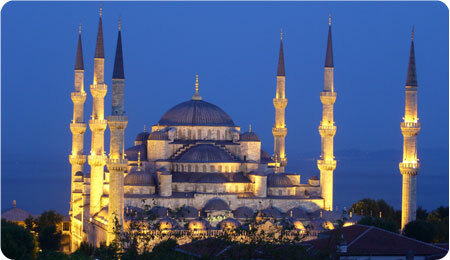 The position itself is also quite advantageous to Istanbulâ€™s cultural depth and diversity. Almost 13 million people live in Istanbul, making it one of the largest cities in the world, and one of the most fascinating. Istanbul receives millions of visitors each year from all corners of the globe. They come to see the ruins of once-great churches, mosques, and palaces. They come to dine in surprising and eclectic restaurants and cafes, to shop at modern malls, and to experience the cityâ€™s famed nightlife. They come to marvel at how Istanbul has managed to sustain its rich heritage while moving forward and embracing new forms of architecture, commerce, and entertainment. While so much has changed within the city and region, one thing that remains the same is Istanbulâ€™s exotic appeal and reputation as a world class city. Here you will have an adventure, not a mere vacation. We also have city guides for Izmir and Antalya. Electricity: 222 volts, 50Hz. Round European-style plugs with two prongs. A city as large and dense as Istanbul can be bewildering to guests. Visiting the city is like going to a supermarket when youâ€™re hungry and then ending up wandering around, dazed by the endless options. However, if you know what youâ€™re hungry for, it makes it much easier to get around. It is the same with this wonderful city. Its options and attractions are extensive, but if you have an idea of what you want to do and what you want to see, you can navigate much more easily and not become overwhelmed by the richness of the city. EminÃ¶nÃ¼ is the heart of Old Istanbul, the center of the famed Walled City of Constantine where much of the cityâ€™s storied history takes place. Within EminÃ¶nÃ¼ lies Sultanahmet, where you will find relics of Istanbulâ€™s rich heritage, such as the Blue Mosque and the cityâ€™s principal mosque, Hagia Sophia. Visitors can see the site where charioteers raced at the Hippodrome, and the Topkapi Palace, where Ottoman sultans lived. Mixed among the ancient obelisks and columns are museums, hotels, shops, and restaurants. Itâ€™s a beautiful mix of ancient and contemporary. This beautiful district gets its name from the fantastic sunsets that throw golden light over the estuary separating the new and old sections of European Istanbul. It was an important waterway for Byzantine and Ottoman navies and trading ships. This area, filled with ancient synagogues, churches, and cemeteries is also a holy place for Muslims all over the world as they travel to the Tomb of Eyup and Eyup Camii. Visit one of the lovely parks or stroll through the shops on the shore while you enjoy the view of the beautiful golden water. Golden Horn is peaceful and tranquil with a touch of modern. The unbelievable scenery of Istanbul will take your breath away. One of the most memorable treats of your visit will surely be a boat ride up the Bosphorus Strait. Have the rare privilege of seeing Europe on one side and Asia on the other. View past and present at the same time as you drift past wooden villas, called yali, or the most modern of hotels. Stone fortresses, beautiful marble palaces, rustic fishing villages, and contemporary communities provide both contrast and a wonderfully unique coherence. Passenger boats are available for incredible six-hour tours, and you can even charter a private cruise to see Istanbul is all its glory. Set aside a day for this. It will be a highlight of your journey. Visitors will discover the European influence on Istanbul in Beyoglu, with its beautiful century-old architecture. Climb the famed Galata Tower to see a 360 degree view of the surrounding city. The nearby Taksim area is wonderful for modern shopping and entertainment. 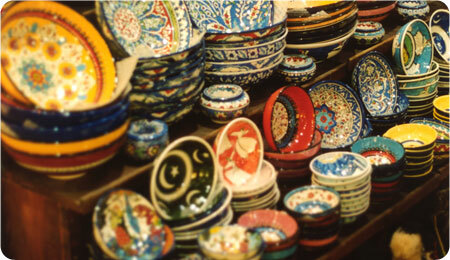 You will find everything from haute couture to vendors selling simit (sesame bread) and souvenirs. The main commercial street, which ends in the bustling Taksim Square, is Istiklal Caddesi, which is open only to pedestrians and the shuttle so you can stroll along and see the sights at your own pace. You will find the Balik Pazari (Fish Bazaar), restaurants, St. Maryâ€™s Draperis, a Franciscan church, the Ataturk Cultural Centre, and five-star accommodations. Stay for the areaâ€™s renowned nightlife and enjoy the bohemian atmosphere. Ottoman rulers escaped the rigors of leadership by visiting Ortakoy. On the banks of the Bosphorus, this area is now a high-end resort town with hotels, restaurants, and shops. A mosque, a church, and a synagogue form its triangular boundaries, also reflecting the cultural diversity of all of Istanbul. 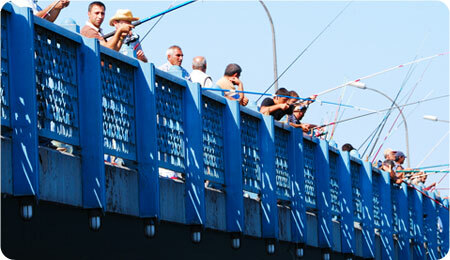 On weekends, locals fish from the shore and visit the tea-house on the waterfront. While a bit expensive for many budgets, it is still a wonderful area to visit. Discover more of Istanbulâ€™s stunning architecture in Uskudar. You will find the Yeni Valide Camii, an Ottoman mosque built in 1710, the green tomb of the Valide Sultan, the Cinili Mosque, built in 1640 and famous for its gorgeous interior tiles, and the Karaca Ahmet Cemetery. Uskudar offers wonderful views of the Bosphorus and visitors will enjoy the scenery while dining in the areaâ€™s many restaurants and cafes. You will find Sariyer where the Bosphorus Stait connects with the Black Sea. If you like fish, this is the place to go. Famous for its fish restaurants serving fresh catches, Sariyer is a favorite with visitors and residents alike, especially on weekends. While in this area, visit the Sadbrek Hanim Museum. This houses an exciting collection of archeological and cultural artifacts. Take a picnic to the largest forest in Istanbul, the Belgrade Forest. Ottomans used to hunt here, and now visitors enjoy the cool, tranquility of the woods. Eight beautiful islands dot the water within an hour of the city, offering visitors a refreshing change of pace. Byzantine monasteries share space with expensive summer homes. The largest island is Buyukada, or the Great Island. You can see 19th Century wooden mansions once inhabited by Greek and American businessmen, and two monasteries grace the top of the twin rolling hills. Cars are prohibited, so you can treat yourself to a horse and carriage ride or bike ride through the wonderful architecture. Shop, dine, visit one of the beaches or picnic areas, and enjoy the ambience. If you want to soak up some sun and admire the scenery, visit Heybeliada, another of Istanbulâ€™s Islands. It is known as â€œIsland of the Saddlebag,â€� and visitors flock to its many beaches to enjoy the sand, sun, and views. Walk or bike along the streets, find the lovely, secluded beaches or visit the public Yoruk Beachâ€™s beautiful bay, and then refresh your energy at one of the great restaurants and tea houses. This is a perfect way to reenergize your mind and body.